Evangelical Christians have been especially attentive to worship in recent years sparking a renaissance of thought and conversation about what worship really is and how it should be done. Even if this renewed interest has resulted in what some have called the “worship wars” in some churches, it seems that what A.W. Tozer once called the “missing jewel” of evangelical worship is being recovered. Though most evangelicals mention preaching of the Word as a necessary or customary part of worship, the prevailing model of worship in evangelical churches is increasingly defined by music — along with innovations such as drama and video presentations. A concern for true biblical worship was at the very heart of the Protestant Reformation. But even Martin Luther, who wrote hymns and required his preachers to be trained in song, would not recognize this modern preoccupation with music as legitimate or healthy. Why? Because the Reformers were convinced that the heart of true biblical worship was the preaching of the Word of God. Music is one of God’s most precious gifts to his people, and it is a language by which we may worship God in spirit and in truth. The hymns of the faith convey rich confessional and theological content, and many modern choruses recover a sense of doxology formerly lost in many evangelical churches. But music is not the central act of Christian worship. The heart of Christian worship is the authentic preaching of the Word of God. John Stott’s simple declaration states the issue boldly: “Preaching is indispensable to Christianity.” More specifically, preaching is indispensable to Christian worship — and not only indispensable, but central. In far too many churches today, the Bible is nearly silent. The public reading of Scripture has been dropped from many services, and the sermon has been sidelined, reduced to a brief devotional appended to the music. Many evangelicals are seduced by the proponents of topical and narrative preaching. The declarative force of Scripture is blunted by a demand for story, and the textual shape of the Bible is supplanted by topical considerations. In many pulpits, the Bible, if referenced at all, becomes merely a source for pithy aphorisms or convenient narratives. The therapeutic concerns of the culture too often set the agenda for evangelical preaching. Issues of the self predominate, and the congregation expects to hear simple answers to complex problems. Authentic Christian preaching carries a note of authority and a demand for decisions not found elsewhere in society. Unfortunately, an appetite for serious preaching has virtually disappeared among many Christians, who are content to have their fascinations with themselves encouraged from the pulpit. The faithful preacher rises in the pulpit to accomplish one central purpose: to set forth the message and meaning of the biblical text. This requires historical investigation, literary discernment and the faithful employment of the analogia fidei to interpret the Scripture by Scripture. It also requires the expositor to reject the modern conceit that what the text meant is not necessarily what it means. If the Bible is truly the enduring and eternal Word of God, it means what it meant as it is newly applied in every generation. Authentic expository preaching is marked by three distinct marks or characteristics: authority, reverence and centrality. Expository preaching is authoritative because it stands upon the very authority of the Bible as the Word of God. Such preaching requires and reinforces a sense of reverent expectation on the part of God’s people. Finally, expository preaching demands the central place in Christian worship and is respected as the event through which the living God speaks to his people. The preacher dares to speak on behalf of God. He stands in the pulpit as a steward “of the mysteries of God” (1 Cor 4:1) and declares the truth of God’s word, proclaims the power of that word and applies the word to life. This is an admittedly audacious act. No one should even contemplate such an endeavor without absolute confidence in a divine call to preach in the unblemished authority of the Scriptures. Standing on the authority of Scripture, the preaching declares a truth received, not a message invented. The teaching office is not an advisory role based in religious expertise, but a prophetic function whereby God speaks to his people. Authentic expository preaching is also marked by reverence. The congregation that gathered before Ezra and the other preachers demonstrated a love and reverence for the word of God (Neh 8). When the book was read, the people stood up. This act of standing reveals the heart of the people and their sense of expectancy as the word was read and preached. Expository preaching requires an attitude of reverence on the part of the congregation. Preaching is not a dialogue, but it does involve at least two parties: the preacher and the congregation. The congregation’s role in the preaching event is to hear, receive and obey the Word of God. In so doing, the church demonstrates reverence for the preaching and teaching of the Bible and understands that the sermon brings the word of Christ near to the congregation. This is true worship. Likewise, the preacher must demonstrate his own reverence for God’s Word by dealing truthfully and responsibly with the text. He must not be flippant or casual, much less dismissive or disrespectful. Of this we can be certain – no congregation will revere the Bible more than the preacher does. If expository preaching is authoritative, and if it demands reverence, it must also be at the center of Christian worship. Worship properly directed to the honor and glory of God will find its center in the reading and preaching of the Word of God. Expository preaching cannot be assigned a supporting role in the act of worship – it must be central. That same reformation is needed in American evangelicalism today. Expository preaching must once again be central to the life of the church and central to Christian worship. In the end, the church will not be judged by the Lord for the quality of her music but for the faithfulness of her preaching. As in the Reformation, the most important corrective to our corruption of worship (and defense against the consumerist demands of the day) is to return expository preaching and the public reading of God’s Word to their rightful primacy and centrality in worship. Only then will the “missing jewel” be truly rediscovered. 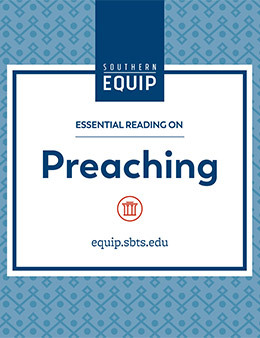 Be equipped for more faithful preaching with Essential Reading on Preaching, a free ebook from SBTS Press.